When Do You Need a Hospital Bed ? No longer are the days where hospital beds are heavy, old, dirty cast iron bed frames with uncomfortable broken spring mattresses. Today’s hospital beds are “lightweight” but still feature a 500 lb weight capacity. Designed so that they can easily disassemble into 5 pieces so that they can be taken apart, transported and set up with easy in very little time. What has also improved is the quality of mattresses that are available. So the question is, “when do you need a hospital bed”? Hospitals beds are not just for those who are sick or elderly or in the hospital. Hospital beds are now referred to as Electric Beds as they have become essential for those recovering from back or abdominal surgery where they have trouble getting in and out of bed, or are unable to position themselves comfortably in a regular bed. The fully electric hospital beds allow you to adjust the head, foot and overall height of the bed to your desired needs independently. When people are forced to spend extended periods of time in bed, the pressure that their body places on the bed causes a lot of heat that becomes trapped between the person’s clothing, bed and skin that will cause pressure sore’s or bed sore’s. These sores are extremely uncomfortable and difficult to manage. Hospital beds will often be recommended as an alternative so that they can re-position their body with easy to rotate themselves and displace the pressure throughout the body to alleviate sore. With certain injuries or surgeries, people with temporarily or permanently lose some of their mobility. Often times, people will have their bed rooms on the second floor and climbing the stairs is too difficult to do post surgery or with some injuries. Hospital Bed Rentals provide a convenient, temporary option to allow you to sleep on the ground level and make getting in and out of bed easier with less pain. People who are going through or recovering from abdominal surgeries, back surgeries, or pregnancy often rent hospital beds as it allows them to sleep comfortably at an angle or position that is not painful for them, and allows them to get in and out of bed on their own. 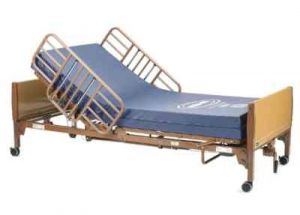 Hospital beds allow users to alter and adjust the bed to better position their head and feet. These changes allow for movement as well as periodic change to the pressure points on the body, thereby improving the patient’s blood circulation while she/he is in bed. Hospital Beds often become a necessity for people with conditions that require caregiver monitoring and attention or occasional restraint from falling. People who are at risk of falling, like those with dementia or cognitive impairment will many times require a hospital bed for the use of half rails to keep them in the bed. The half rails are adjustable to slide up and down out of the way, designed to keep people in bed or provide a stable and secure item to assist getting out of bed. One of the most significant benefits of hospital beds is the ease of transferring. Hospital beds allow the caregiver to raise or lower the bed to a height that makes transferring the patient to a seated position, chair, wheelchair, or walker easier and reduce pain. Those with hip pain, lower back injury or pain, and some surgeries make moving and getting in and out of bed painful. The fully electric hospital bed and its ability to raise or lower makes getting in and out on ones own much easier. Caregivers receive an unexpected benefit from the use of hospital beds with their patients or loved ones as picking them up out of bed, or carrying them from bed to chairs etc can become physically taxing on them. The elevating hospital bed can raise to higher height to make transferring the patient easier and less stressful on the body. The raising head section of the bed allows the caregiver to move the patient to a seated position before transferring which is less work for the caregiver and helps in preventing injuries. The happier and healthier the caregiver feels, the more excited they will be to go to work and take care of their friends, family or patients. If the caregiver is in pain all day it is prolonging a serious injury, or may lead to shortcuts that cause an injury or mishap to the people they are looking after or themselves. Our staff delivers and services hospital bed rentals and purchases throughout Colorado, including but not limited to: Colorado Springs, Monument, Franktown, Elizabeth, Parker, Lone Tree, Highlands Ranch, Aurora, Centennial, Englewood, Centennial, Denver, Golden, Wheatridge, Arvada, Lakewood, Broomfield, Brighton, Westminster, Boulder, Lafayette, Erie, Superior, and Louisville.